It is in the complementary and equally important approaches where change and growth must be made. All too often in the past society has devalued our best qualities, those that are natural to women. Our feminine gifts are attributes such as: relationship building, peacemaking, language, creative thinking, and more. By exploring these gifts and applying them to your day-to-day life, you will see positive changes in your own life and the world around you. You will be able to adapt to the innovations and changes that are necessary for the future. As women are equally valued for their contributions, we will be able to overcome the limitations and inequalities imposed on us by a masculine dominated economic, political and cultural society. Among the natural attributes of women are collaboration and team building. (And, we hold many more.) Our ability to use these gifs has been recognized by such groups as CARE, Heifer International and The Hunger Project. (See notes below.) These groups have invested their resources and total faith in women to rebuild their communities as they know that women will use their opportunities to feed their families and strengthen their communities. We will begin our Living Room discussion with the topic, “Inviting The New, The Different and The Good Into Our Lives”. After the initial theme has been presented we will be opening the lines for announcements, wishes, desires, and general networking. Please contact us at info@theessentialfeminine.com if you have something you would like to share during the second half hour. We need at least forty-eight hours prior to each Living Room event for your comment or need to be considered. We hope that you will take advantage of this opportunity to join women from around the globe and help us create a community of women who want to create their lives from their true selves and thus make a difference. Say good-bye to 2009 and transform your 2010. In a year that has seemed to emphasize failure, financial stress and doing things the hard way, we have an opportunity to make a change. 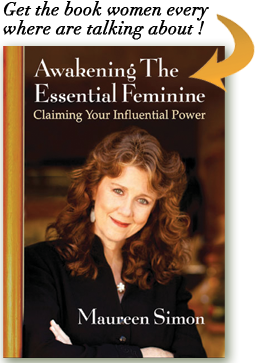 Our time is now to create powerful, influential success with ease and from a Feminine Perspective. Women hold natural talents and gifts that are particularly essential in business, relationship building and politics today; gifts, such as being relational and caring, holding advanced communication skills and being able to actively see the whole in the environments in which they live. We can use these gifts in creating a blueprint for 2010 which will transform our lives and the lives of those around us. There is no greater time in the history of the world where these feminine traits and attributes have been more needed. If we take a moment to look outside ourselves, we can’t help but see the imbalance in our world. Over a hundred years ago, Baha’u’llah (Founder of the Bahia Faith), wrote, “The world in the past has been ruled by force, and man has dominated over woman by reason of his more forceful and aggressive qualities both of body and mind. But the balance is already shifting – force is losing its weight and mental alertness, intuition, and the spiritual qualities of love and service, in which woman is strong, are gaining ascendancy. Hence, the new age will be an age less masculine, and more permeated with the feminine ideals — or, to speak more exactly, will be an age in which the masculine and feminine elements of civilization will be more evenly balanced.” Are we ready to create that new age? Are we ready to bring forth the feminine attributes that can transform our world? To me, it would not be a successful world if women elbowed men out and stepped in to the limelight of our world’s leadership. But as Baha’u’llah mentions in the quote above, we will all benefit from a world where the masculine and feminine elements are more evenly balanced. These changes will not happen without us; women stepping up, claiming our feminine attributes and learning to use them to create balance within ourselves first.